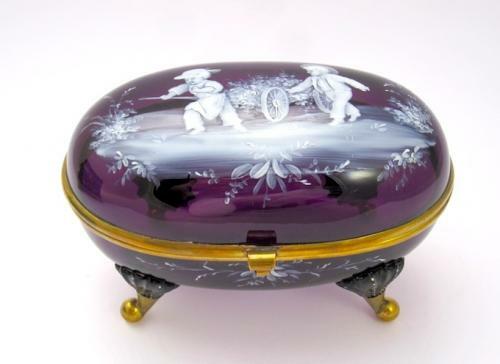 Antique Amethyst Glass Mary Gregory Casket Box with Unusual Scrolling Feet. Lovely Decoration of 2 Children Playing. Mary Gregory Refers to a Term used to Describe Decoration by the American Artist Mary Gregory and other Similar Artists of Her Time. They were Known for Paintings of Victorian Children.